One month into the season, well since Walleye and Pike opened here in the North. Things on the fishing front are pretty good. The season didn't start to good as I was ill with a cold that turned into a couple infections. The last few weeks I've been trying to make up for the lost fishing. The middle of May I finished my last day of antibiotics and it was time to get a line in the water. I want to share some of my bait choices and a few of my own personal tips. With the extreme heat we've had this spring water temperatures are warmer than usual. This means fish are spawning earlier, weed growth is booming, and the fish are very active. The warm humid days seem to get the Gar going, Gar love to cruise the surface to breath oxygen and they also target bait fish around the surface. The Super Spook Jr. works great when the Gar are surfacing. A slow retrieve draws the fish in. They might tap the bait a couple times before they actually hit it. Over the past few years I have learned patience is probably one of the most important things when it comes to fishing the prehistoric beast. It's not uncommon to miss several fish in an evening of Gar. Other baits will work for Gar, but for beginners I recommend top water. Its a lot easier to time your hook set if you can actually see the fish hit the bait. A slow swimming Gar following your top water bait will have your body pumping with adrenaline as the anticipation builds. I use a gentle hook set when A gar hits my bait, a hard hook set will usually rip the bait out of their mouth. Notice the wound on the Gar above. I almost certain that is a Lamprey that did that. Always be prepared when handling these fish. They are extremely strong and have lots of teeth. A glove, a couple sets of pliers, and common sense will save you from cuts and scratches that could send you to the ER for some stitches. Trying to pry the long snout open doesn't always work. I insert the closed pliers in the mouth and gently open them to open the Gar's mouth, I then use the other pliers to take the lure out. If your not having success with your hook set, try downsizing your hooks. A great place to start if your just getting into Gar fishing is RJnBirdies Outdoor Adventures. 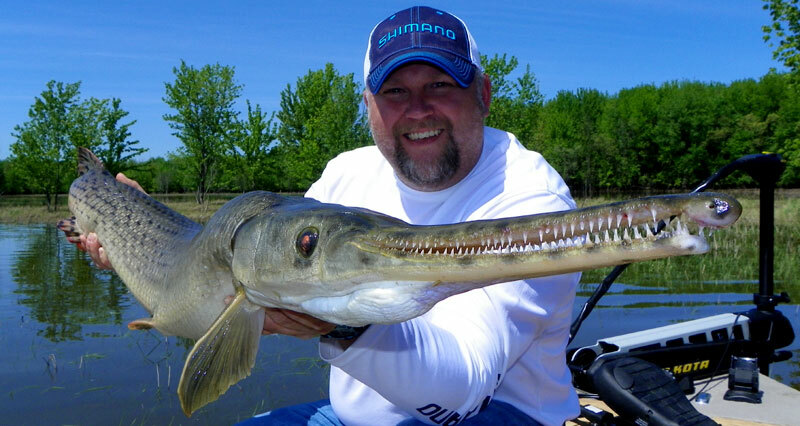 Rob Jackson is one of the premier Gar anglers in Canada and he offers guiding services for these fish. Just recently Rob Broke the Ontario record for Gar. Check out their website below. This time of year many species of fish are ready and willing. After the Walleye spawn it's not uncommon to find them in the shallows looking for food. I took the opportunity to hit up some of the shallow bays in search of some Walters, that's what their known as in my neck of the woods. Do eight plus pound Walleye hang out in two feet of dead water in a bay, I can confirm they do. That fish was caught on an XPS minnow in about a foot and a half of water. I tweaked the bait with one red treble in the middle. The bait only runs four to six feet in depth, a slower retrieve keeps the bait just below the surface in the shallow water. This bait wobbles back and forth so the red treble in the middle really gives off a nice flash as the light reflects off the hook. This Walter I caught two feet from shore in roughly two feet of water. Notice the middle red treble buried in it's mouth. The other two trebles, one on the front and one on the back are bronze. By adding a red treble in the middle I am giving the fish a target and if they miss then there is a good chance it will hit one of the other trebles. I've been using this set up for the last couple of years and I can tell you 98% of the time it's the middle red treble that is buried in the fish's mouth. Just ask the Kitty Cat below. Little surprised when I pulled that up. I guess they'll hit anything. Another nice Walter caught on the XPS Minnow. It's not unusual to catch a few Bass this time of year as well. I had to replace that red treble quite often. I had a nice Musky on the XPS, it almost spooled me and the lure popped out. It was a biggy, almost brought tears to my eyes. I went back the next night for some redemption. It wasn't the big Musky I was looking for but it was a beautiful looking fish and it put up a great fight. That was also caught on the XPS minnow. The bait is a Bass Pro brand and it sells for roughly three bucks. A cheap investment with a great return. A great pass time is jigging for Pan fish. I sometimes do this until the big fish come out to play. I hit the water with a Lindy tube and a Berkley beetle tube. They love those little tube jigs, it's buried in there. I used a red sharpie to add some color to the Lindy tube. I caught a decent Bass on the little Lindy tube, I can tell you they are very durable. I didn't think that fish was coming in. I though the hook would snap. I release the fish and continued to catch fish with it. Pan fish are a dime a dozen and will almost always bit. It's a great way to pass the time. In search of some Pike I decided it was time to get the pond hopper out and go searching for some Gators. it wasn't easy, it took four hours of searching but I found them. I loaded my gun with a Super Spook Jr. and a Strike King Buzz (white). With all this warm weather I found some good weed beds. I was in twelve feet of water and the weeds were roughly two feet below the surface. Perfect for Pike. I ran my bait down the weed lines to draw the Pike out from the cover. The next day I was running a Super Spook Jr.
Don't be afraid to run a top water bait when the water is choppy. There is more activity with bait fish when the water is a little rough, this will get the Pike moving. It was an explosive time, the Pike were blowing up on the bait. That Eagle kept circling me, never alone when your on the river. In the two outings I caught quite a few Pike on those two baits. I kept it simple, It was all about location. Look for the weeds and start attacking them. All my fish are catch and release, put them back for another day. That has been some of my outings from the last couple weeks. My Bass season starts this weekend at Cayuga Lake in Auburn New York. It's the first New York B.A.S.S. Federation tournament hosted by Bass Pro Shop. There is going to be some great anglers from Canada and the U.S.A. I am looking forward to fishing this event, should be a lot of fun. I hope everybody has a good weekend on the water.